A searing summer heat wave in Europe, sunny day flooding in Miami, one of Alaska’s worst wildfire seasons and heavy rainfall in China — these were just some of the extreme weather events of 2015 for which climate change provided a discernible push, according to the Bulletin of the American Meteorological Society’s annual attribution report, released Thursday. The Aggie Creek Fire near Fairbanks, Alaska, on July 7, 2015. Over the last five years, the BAMS report has examined more than 100 events as part of a burgeoning sub-field of climate science that uses observations and climate models to show how human-caused warming has already affected the odds or severity of many of the weather extremes we experience now. Of those, the fingerprints of climate change have been found on about two-thirds, particularly for heat events, where the warming influence has been almost universal. Others, though, such as precipitation extremes, have been more of a mixed bag. This year’s report featured more types of events scattered over a wider area of the world than before. For the first time, researchers also had to consider the possible influence of an exceptionally strong El Niño, as well as for taking attribution a step further by examining how climate change actually affected people, for example by impacting human health. “If we can better understand why these events are happening, we can better predict and prepare for them in the future,” lead editor of the report, Stephanie Herring, said during a press conference at the annual meeting of the American Geophysical Union, where the report was presented. Ten of the heat events examined, including the global record-hot year, had a clear climate change influence, researchers found. An increase in heat extremes is one of the clearest outcomes of global warming. One study found that summer heat waves, like the one that sent temperatures in central Europe to record highs, are occurring more frequently, while another found that record-breaking heat in Northwest China (where July temperatures soared above 110°F) was made three times more likely. Two studies went beyond mere temperatures to look at the collective impact of heat and humidity — when both are high, that increases heat stress, with implications for human health. The deadly heat stress associated with an August 2015 heat wave in Egypt was found to be 70 percent more likely, underscoring the heavy toll of climate change on humans. Another study in the report found that high heat indices in separate heat waves in India and Pakistan were made at least 800 percent more likely by climate change. Climate science isn’t quite at the point where all extreme heat events can be assumed to have the imprint of climate change, Adam Sobel, a Columbia University climate scientists who wasn’t involved in the report, said, but it is getting close. 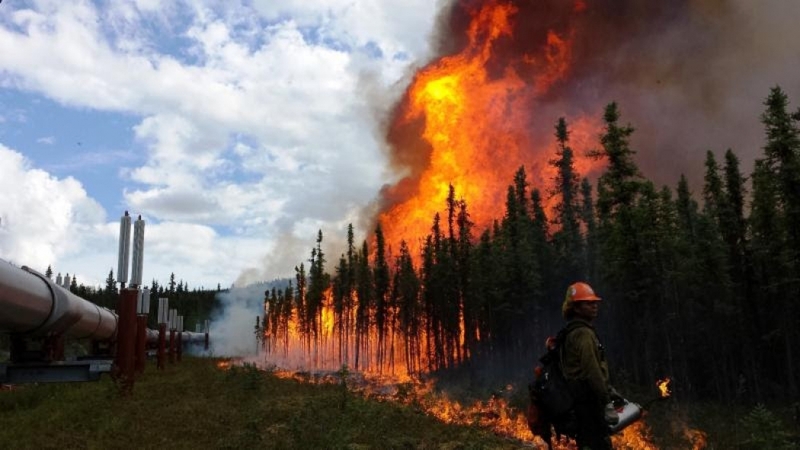 Manmade warming was also found to play a role in other types of events where heat was a factor: Alaska’s 2015 fire season, the second worst on record in terms of area burned, was found to be about 30 to 60 percent more likely because of climate change. Similarly, the “snowpack drought” in Washington state that resulted from high temperatures making precipitation fall as rain instead of snow was found to be more likely to occur in the future because of warming. “The five years of this report from BAMS has shown that we’ve made enormous progress in attributing meteorological events,” Friederike Otto, an author on several of the studies in the report, said during the AGU press conference. Otto, a climate scientist at the University of Oxford, also works with Climate Central’s World Weather Attribution program, which attempts to conduct rapid attribution assessments in the days and weeks after an event. Other events for which a climate change role was discernible included some types of events never before featured in the report. The nearly 2 feet of water that flooded the Miami area on Sept. 27, 2015, despite no storm in sight — a phenomenon called sunny-day flooding — has become 500 percent more likely, purely from the sea level rise that has occurred since the mid-90s, researchers found. People cool off from the heat at the Miroir d'Eau (Mirror of Water), a public art piece on the quay of the Garonne River, during a warm summer day in Bordeaux, southwestern France, June 30, 2015. For other events, though, no clear influence from climate change could be detected. The extreme cold that kept the eastern U.S. in a deep freeze in the winter of 2014-15 was actually less likely to occur with warming, two studies found, despite other research that has suggested that declining Arctic sea ice could be causing more excursions of Arctic air over North America. No climate change signal emerged for the delayed rainy season onset in Nigeria or for a heavy rainfall event in Chennai, India, either. In the latter case, increased aerosols might be masking any global warming-related trend, the authors say. About 35 percent of the studies in all five BAMS reports haven’t found a climate change influence, but Herring notes that may not mean that such an influence isn’t there. “There’s lots of reasons why a paper may not find a role for climate change,” she said. Any climate change trend may not yet be discernible or today’s methods may not yet be sophisticated enough to tease it out. Or a study may not have looked at the right factors, “so we don’t actually have the complete story yet,” she said. The report editors also note that the studies don’t cover an unbiased sample of events, as they are picked by the authors, who often choose weather extremes from their own backyard. An added twist for 2015 was the major El Niño event that also altered weather patterns around the world, leaving the possibility that both El Niño and climate change might have influenced the same event. “We didn’t know if we’d be able to differentiate the two,” Herring said. But several of the studies were able to tease apart their relative contributions. 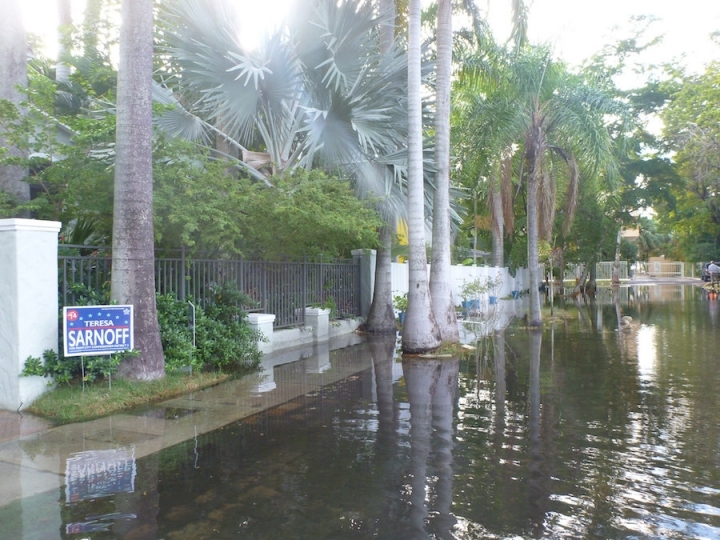 Sunny day flooding in Miami in October 2015. For example, the extreme drought that gripped Indonesia during summer and fall (leading to an intense wildfire season) was caused by a dearth of rainfall linked to El Niño and higher temperatures linked to climate change, one study in the report found. In future BAMS reports, the editors hope to consider a wider array of events to continue to push attribution science forward. They also want to make more forays into attributing actual impacts, like heat-related deaths and infrastructure damage, but that takes building partnerships between different disciplines, such as water management and epidemiology, which takes time. “I don’t know if we’ll see an explosion just yet,” Herring said. For next year’s report, 2016 has offered up a strong selection of events to potentially examine, from torrential downpours across the U.S., to more heat waves. There’s one event in particularly that Herring hopes someone will tackle, though: Hurricane Matthew, one of the few significant tropical cyclones to make landfall in the U.S. in recent years. “I would love to see someone take that one on,” Herring said.